There was a newspaper cutting slipped into my old 1912 copy of "The Morris Book" by Cecil Sharp. This cutting is an obituary for William Kimber, so must date from the end of 1961, the year in which he died. I reproduce the newspaper cutting below, and I include a transcription of its text at the bottom left of the page. The Morris Book (opposite page 29) has a picture of Mr William Kimber wearing the traditional costume worn by the Headington men which I reproduce below. It also has passages describing his role in the Headington Morris, and how he learned to dance from his father, who also taught him the Morris tunes - I reproduce these extracts below the picture. Mr. William Kimber, the well-known morris dancer, died at Headington, Oxford, on Boxing Day in a house he had built for himself many years ago. He was in his ninetieth year. He was a bricklayer; on Boxing Day, 1899, when he was out of work because of the hard winter ("three weeks without a pay packet") the Headington Quarry morris side went out to earn a little money, although it was not the usual time of the year for the morris. At Sandfield Cottage, Mrs. Burch's house, they danced Laudnum Bunches and Rigs o' Marlow; the side was turning to go when her son-in-law called to them from the window; this was Cecil Sharp, who had heard morris tunes for the first time; and he asked Will Kimber to come the following day and play over some of the Quarry morris tunes. Next day Will played Beansetting and Constant Billy. Cecil Sharp wrote them down, then went across to the piano and played them. Sixty years later Will would talk of this with admiration: "I'd never seen anything like that before." From that meeting flowed Sharp's great work of recovering so many of the morris dances of England and teaching them to the early dancers of the morris revival. In this work he used Kimber as his right hand man, since much of the material collected needed the help of an experienced morris man; "Often enough, me and five chairs", said Kimber. He would spend days at a time in London; and while Sharp lectured, Kimber would demonstrate steps and dance jigs; he found it better than bricklaying. The value Cecil Sharp himself put upon Kimber's work is shown in a letter written to Will shortly before Sharp's death. "Had it not been for our lucky meeting on December 26, 1899, at Headington, and the prominent part which, in the early days of the movement, you took not only in giving practical instruction but by capital demonstrations in public, the movement would never have been launched." The old man lived to unveil a memorial plaque on Sandfield Cottage, 60 years to the very day when Sharp had called out to him; to refer with considerable satisfaction to "his morris sons" now dancing in the many clubs in every part of England: and to feel a natural pride in the part he had played in the great morris revival. Will Kimber did not look for retirement in the morris; to the end he was training boys at the local secondary modern school. His memorial is the present day Headington Quarry morris side, worthy successors to many generations of Headington morris men; and the affection of hundreds of morris men who had known him, and knew what they owed to him. 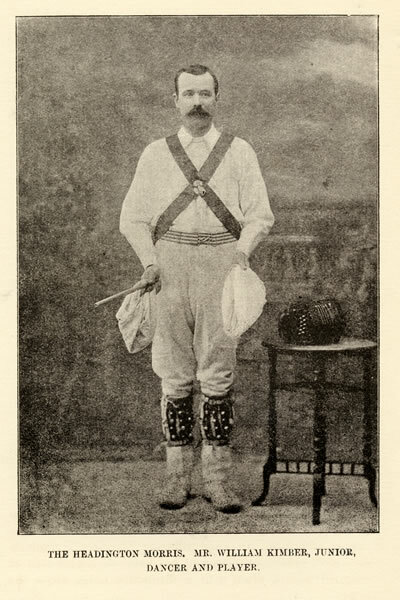 The Headington Morris tunes given in the music-book were noted from Mr. William Kimber, jun., a first-rate performer on the concertina. The Headington men seem always to have danced to a fiddle until thirty years ago, when their fiddler, old Frank Cummings, died. Another fiddler, George Young, took his place, but only for a year or two - i.e., until 1887, when the old Morris side was disbanded. At the revival in 1889, yet another fiddler, Mr. Cox, was pressed into service, one of the older dancers teaching him the tunes by humming them to him. But he never played the jig airs, and he very soon retired. His place was, in turn, taken by Mr. William Kimber, jun., who was playing for the side when we first saw the Headington men dance in 1899. Mr. Kimber learned the tunes from his father, who was foreman of the original side - i.e., up to 1887. Mr. William Kimber, sen., was not only a dancer, but an excellent musician as well, and no mean performer on both fiddle and concertina. During the last few years of the life of the original team he often left the ranks of the dancers to act as substitute for the regular fiddler, who was then getting very old. The Headington tunes, as we noted them, can therefore be traced through Mr. Kimber and his son directly to the original fiddler, Frank Cummings, and are therefore as authoritative as, in the nature of things, traditional tunes can ever be. To trace the history of a village tradition through all its vicissitudes is always a matter of some difficulty. But, so far as we have been able to ascertain, the Headington Morris men appear to have danced annually, without break, down to the year 1887, when for some reason, probably the lack of a suitable fiddler, the dancing was discontinued. Ten or twelve years later, Mr. Percy Manning interested himself in their affairs, and succeeded in prevailing upon the Headington dancers to make a fresh start. A public exhibition of the Headington Morris was accordingly given in March, 1899, at the Corn Exchange, Oxford, and attracted some attention. In a contemporary account, which appeared in one of the newspapers, it was stated that "four of the men danced the figures twenty years ago from traditions handed down by their fathers and grandfathers" (Oxford Review, March 16th, 1899). The break in the continuity of the dance cannot, therefore, have seriously affected the purity of the tradition. Unhappily, the renewed interest created by Mr. Manning soon waned, and it was not many years before the side was again disbanded. Our knowledge of the dance has been gathered from Mr. William Kimber, who danced in the side for a short while after the revival, and afterwards played for it. He learned the dances from his father, one of the old dancers, who joined the team as a lad of eighteen in the year 1868, and danced as Foreman of the side for fifteen years - that is, until it was disbanded in the first Jubilee year. Mr. Kimber, senior, who has himself on more than one occasion given us great assistance, is a musician as well as a dancer. He told us that he remembers playing the Morris airs to his son when he was in the cradle, to lull him to sleep, and that he taught him to dance when he was a schoolboy. It was this son, Mr. William Kimber, junior, who, with his cousin, came up to London in 1906, and, by passing on to others the tradition that he had inherited, laid the foundations of the present revival. In his portrait he is dressed in the traditional costume worn by the Headington men. While the authors desire to thank friends too numerous for individual mention, who have given able and willing help in the preparation of this book, they feel that peculiar gratitude is due first and foremost to the following Morris-men: Mr. William Kimber, Senior, and his son, Mr. William Kimber, Junior, for information concerning the Headington dances; Mr. Michael Johnson and Mr. Michael Handy for similar information about those of the Ilmington tradition. Of Mr. William Kimber, Junior, they would add that besides the invaluable help he afforded them in recording the dances, his own vigorous and graceful dancing at various public displays has, by showing what traditional dancing can be and setting before the dancer of the revival a high standard of technical accomplishment, forwarded the movement in a practical and altogether admirable manner. the story of Cecil Sharp and his chance encounter with William Kimber, reproduced from Cecil Sharp by A.H.Fox Strangeways, In collaboration with Maud Karpeles, Oxford University Press, London 1933.